“Upkari”(or stir-fry) is a very simple vegetarian dish which is a regular in most Mangalorean households. You can make ‘upkari’ with any vegetable (cabbage,beans,radish, string beans,etc) or with any green leafy vegetable. ‘Upkari’s’ are traditionally made by adding the chopped vegetable/leaves to the tempering along with one or two slit green chillies and cooked till done. At the end, a garnish of freshly grated coconut(Mangalore is a coastal town in Southern India and has an abundance of coconut trees,and hence the use of coconut in almost every dish) is added which gives it the characteristic flavor. 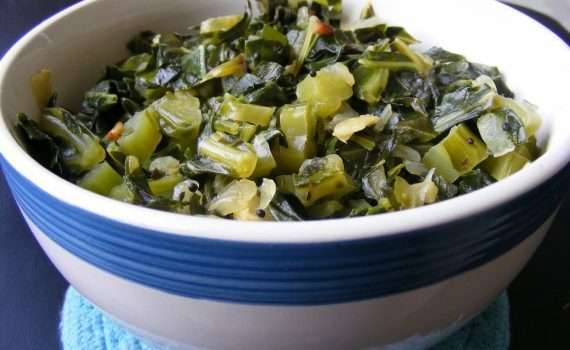 I’ve modified the recipe for the collard upkari by adding some chopped onions, and a pinch of asafoetida(hing) as I like the flavor it adds to the dish. Heat the oil in a pan and add the mustard seeds and urad dal. When the mustard starts to pop, add the asafoetida and the curry leaves. Add the chopped ginger,slit green chillies and onions and saute till the onions turn translucent. Add the chopped collard (or any of the other vegetables/green leafy vegetables) and stir-fry for 10mins. Then add a little water, salt to taste and cover and cook till done. Garnish the collard upkari with the coconut scrapings. Serve hot with a dash of lime (goes well with dal and rice). Note: You can add 1/2 cup of split moong(wash and soak for 15 mins-add at step 5 with the water) or cooked pulses(kabuli channa) to add some protein to the dish. Q. 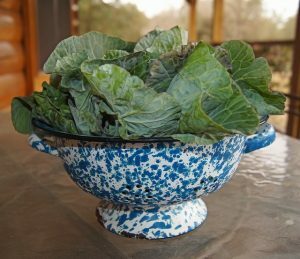 Which is your favorite recipe with greens?